At the annual meeting of the American Association for the Advancement of Science in Boston, yesterday, paleontologist Paul Sereno of the University of Chicago gave a rare show-and-tell of fossil discoveries from his expedition to Africa's Sahara desert. Sereno and his team described the 40-foot African crocodyliform Sarcosuchus imperator in Science last October. But the 20-tons of rocks they found two years ago contained many other treasures not yet published in the scientific literature. At yesterday's sneak preview, Sereno boasted unusual fossil finds including a ducky crocodile skull and a Spinosaur wishbone. Walking across a plane of eroded rock in Niger, Sereno and colleague Jack Conrad were surprised to find the skull of a tiny dwarf crocodile alongside parts of the giant Sarcosuchus. They dubbed the skull "duck-croc" because its nose faces forward with "a muzzle that looks like a duck," Sereno said. The nickname stuck. Only three and a half inches long, duck-croc's skull sports a broad upper jaw that hangs over the lower jaw. The two-foot long duck-croc lived 110 million years ago on the banks and in the waters of a river stream. Sereno thinks this unusual jaw structure allowed the duck-croc to capture its prey. "It probably was spending more time on land eating tadpoles and fish along the bank." The skull is so far the only discovered part of the predator. 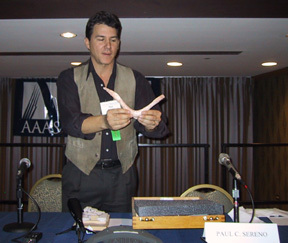 Paul Sereno holds the duck-croc skull at the meeting of the American Association for the Advancement of Science in Boston. Photos by Christina Reed. The duck-croc is one of two small species among six crocodile species that span the range from 2 feet to 40 feet, Sereno said. "This duck crocodile and the kinds of crocodiles we found at one time in one place really underscores what a different world it was for crocodiles during the dinosaur era. We see only a slice of crocodile life today that look pretty much uniform. Back then it was a much more varied group along with the dinosaurs dominating their habitat." Within a 50-mile radius of where they found duck-croc in Niger's Gadoufaoua region, Sereno and his team uncovered the first Spinosaur furcula or wishbone. "It fits right between the chest region just like you would find on a turkey only less flexible," he said. The wishbone belongs to a "weird, weird crocodile-headed dinosaur" called Suchomimus teneresis, the dominant large predator of its day, Sereno said. Spinosaurs in general are among the most primitive of the theropods, the dinosaurs thought by many paleontologists to be the ancestors of birds. "It's not that it's producing any striking new finds that way. It's just nice to bracket yet one step further down the theropod tree, and to say that Spinosaurs had furculas, and so did the first large predatory dinosaurs therefore." Paul Sereno delicately displays the 110 million-year old Spinosaur wishbone, it's not as flexible as a turkey's wishbone he says. 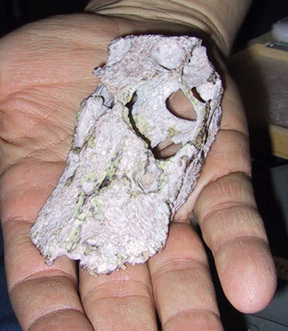 Sereno looks to Africa for future fossil clues to dinosaur origins and evolution. "What's there is Africa's story of dinosaurs - one of the great frontiers."